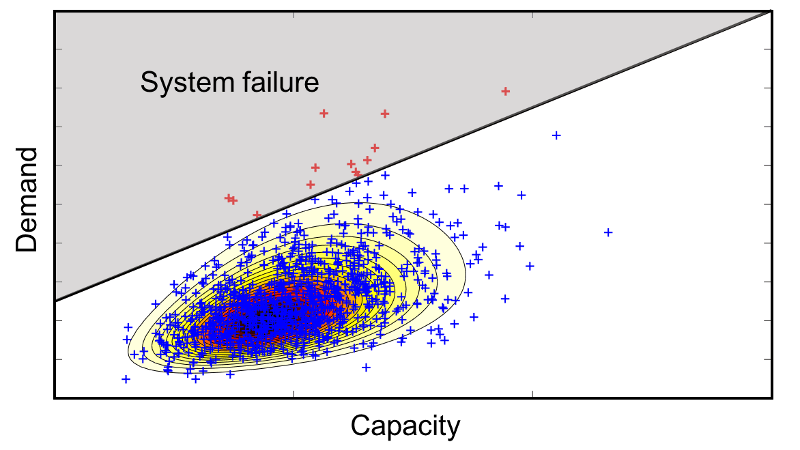 By expressing our uncertainties about engineering systems in terms of random variables, one can determine the probability that the response of the system is not acceptable. Based on this, one can get the reliability of the system of interest. We help our clients in setting up appropriate probabilistic models for a reliability analysis, we provide software tools for our clients that solve the associated problem, and we help our clients in interpreting the obtained results. In reliability analysis, the aim is to evaluate the probability that the engineering system of interest is in an unfavorable state. The first main challenge to face in reliability analysis is to set up an appropriate probabilistic model. This step is typically not very intuitive, and there are a number of pitfalls associated with this step. If an inappropriate probabilistic model is used, the evaluated reliability is meaningless. We are experts in probabilistic modeling and assist our clients in determining an appropriate probabilistic description of their models. The second main challenge is to select a suitable reliability method and to solve the associated reliability problem. We provide our clients with efficient and robust software tools tailored for their specific needs. Finally, we also help our clients to interpret the evaluated reliability and decide whether it can be accepted. The following video tutorial explains some of the basics of reliability analysis.